In this section, you learn how to configure your profile and manage your email notifications. Click in the upper right corner of the top band. Navigate to Personal Preferences section and click User Profile. Click to the right of the profile name to update your personal information. You can also Change Photo, if needed. Pick a Theme to set your portal background. 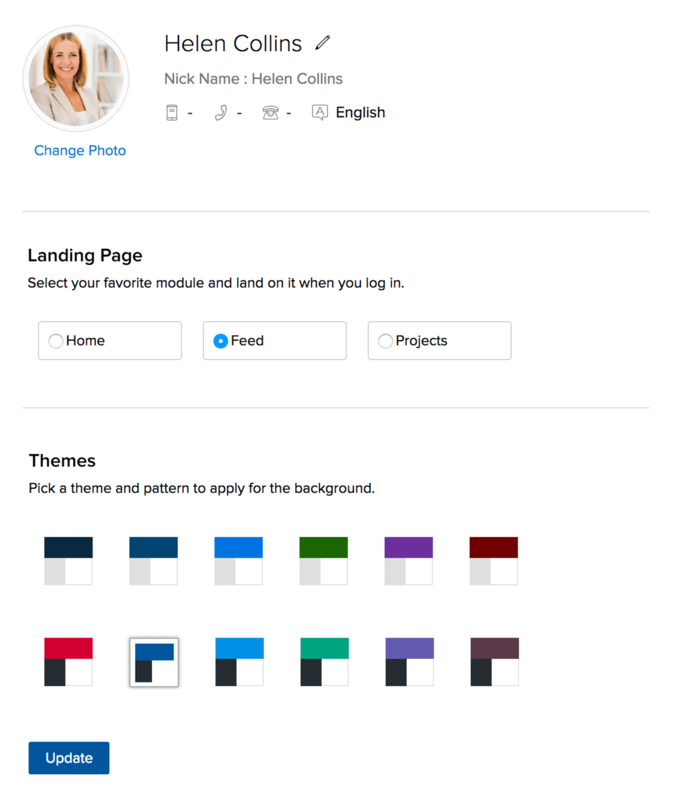 Set your favorite or the most used project module page as the Landing Page. Click in the upper-right corner of the top band. Navigate to the Personal Preferences section, click Notifications, and click Email. Toggle switches to manage Milestone Notifications. When you switch on the notifications for a category, you accept to receive emails for the category. Toggle switches to manage Other Notifications for the milestones created by you and assigned to you. You can choose to receive email notifications when a message is posted in a forum, when you get a direct message, when a new document is uploaded, and when a time log is rejected. If you wish to receive Emails by default for all the activities in which you are involved, switch on the Notify me for all my activities option. You can receive emails at a frequency set by you. Choose the frequency in the Is your inbox flooded with emails? section. The changes are automatically saved. To go back to another setting, click in the upper left or click beside the current section's name in the top and navigate to any other section as you wish. If the number of notification emails are overwhelming you can choose to receive a consolidated email at a defined frequency. Navigate to the Personal Preferences section, click Notifications, and clickEmail. Select your Frequency under the Is your inbox flooded with emails? section. The following notifications will not be sent via email summary. Configure your Email notifications for the pending and unassigned bugs from your personal settings. Navigate to the Personal Preferences section, click Notifications and click Activity Reminder. Daily Digest - the list of pending bugs and milestones across all the projects will be sent to you. Unassigned Bugs - the list of unassigned bugs (i.e. bugs that don't have an owner) across all the projects will be sent to you. 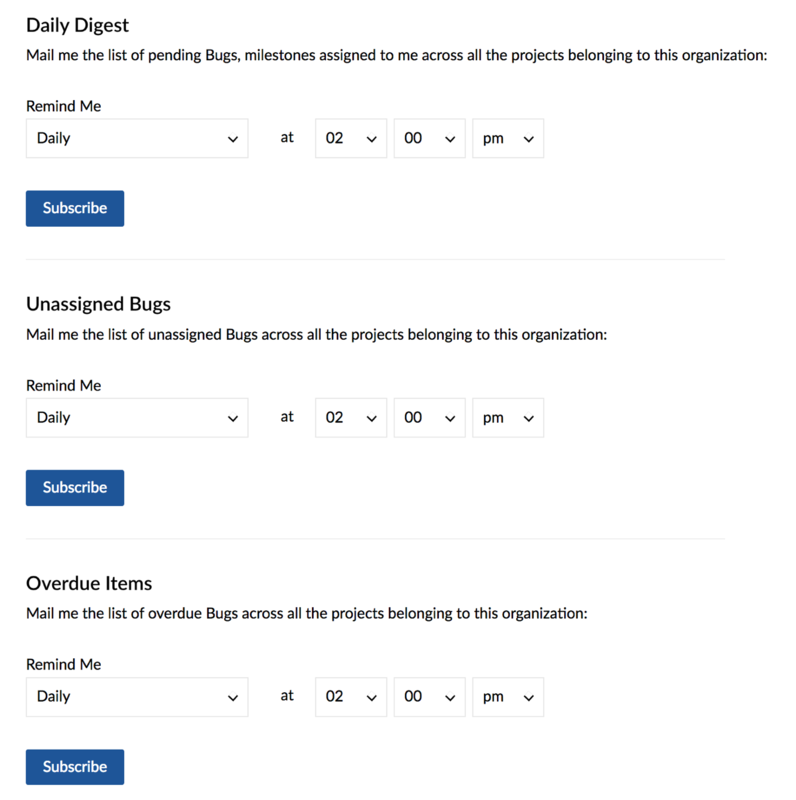 Overdue Items - the list of overdue bugs accross all projects will be sent to you. Set the frequency of the reminder emails in the Remind Me field (i.e. Daily, Weekly, or Monthly). Select Time to receive the notification emails for pending bugs and then click Subscribe.